The production of the Patrologia Latina Database was undertaken with the advice and assistance of an Editorial Board. The board resolved that the database should contain the whole of Migne's Patrologia Latina. No part of the text - prefatory material, various kinds of notes, appendices - was to be omitted. Since the Editorial Board took as its first principle the obligation to keep Migne's text intact, it further resolved not to intrude into the Patrologia Latina with textual emendations. The Board did decide however that it would be useful to include more recent bibliographic information in the coding of the data. Consequently, individual documents have been given one of three codes each corresponding to one of three standard reference works. In addition, the Editorial Board decided that a distinction should be made in the Patrologia Latina Database between medieval and modern authors. Patrologia Latina Database offers the works of the Latin Fathers in a fully-searchable electronic format. The Patrologia Latina covers the works of the Latin Fathers from Tertullian around 200 AD to the death of Pope Innocent III in 1216. In 221 volumes, it covers most major and minor Latin authors, and contains the most influential works of late ancient and early medieval theology, philosophy, history, and literature. 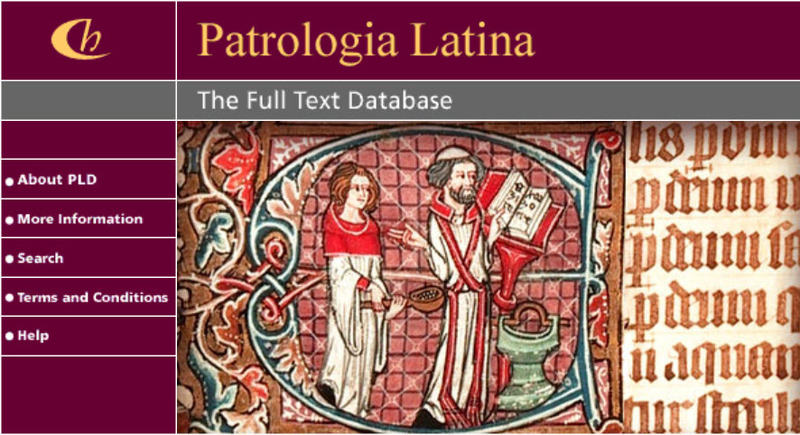 The Patrologia Latina Database contains 221 volumes and represents a complete electronic version of the first edition of Jacques-Paul Migne's Patrologia Latina (1844-1855 and 1862-1865). Migne's Patrologia Latina was originally printed in 217 volumes from 1844 to 1855. There were two series: the series prima, volumes 1-73, (Tertullian to Gregory the Great), 1844 -1849; and the series secunda volumes 74-217, (Gregory the Great to Pope Innocent 3rd), 1849-1855. Migne himself reprinted volumes up to 1865, at which time he sold the literary rights for the Patrologia Latina to the firm of Garnier in Paris. In February of 1868, a fire destroyed Migne's presses and his printing plates. Garnier had already begun reprinting parts of the Patrologia Latina three years earlier and proceeded to reprint the entire set by 1880. Unfortunately, these reprintings - and all subsequent editions by Garnier - are inferior in a number of respects to Migne's own first editions. Consequently, the Patrologia Latina Database has been based exclusively on the copies of the first edition of the texts and indices. Migne originally intended the Patrologia Latina to span the whole history of Latin Christianity up to the eve of the Reformation. However, he eventually judged that it would be wiser to conclude the series with the year 1216 as, after that year, the explosion of philosophical and theological writing made it impossible for any series to include even representative portions of the principal texts. The main chronological sequence of authors in the Patrologia Latina therefore runs from about AD 200 to AD 1216. However, Migne did incorporate medieval texts written after 1216 where these were traditionally attached to an earlier work, often as a commentary or an introduction to it.